Fabric structures have been extensively used in car parks and roof structures due to their versitality in design & function. 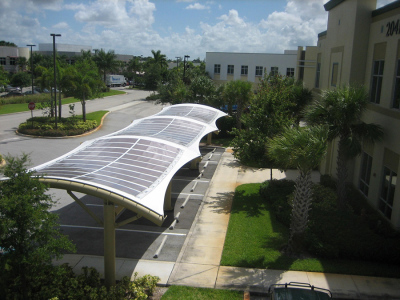 While the region is turning towards renewables, we provide our clients to retrofit their existing tensile fabric structures or design new projects with light weight flexible PhotoVoltaic panels that could be installed without effecting the performance of existing structures. This is indeed conserving resources and maximising the potential of existing spaces and generating energy.